In late 2015, the United Nations General Assembly declared 2017 as the ‘International Year of Sustainable Tourism for Development’. This was, without doubt, a global recognition of tourism as an important contributor to the development agenda through economic growth, social inclusion, as well as cultural and environmental enrichment and preservation. UNWTO was designated by the UN General Assembly to coordinate the activities and the celebrations of the International Year. With your support and the great support of our partners, we have promoted the value and contribution of sustainable tourism to development, to inclusive economic growth, social empowerment cultural and environmental enrichment and protection as well as mutual understanding, peace and justice. This was in many ways a once-in-a-lifetime opportunity to come together and work closer in making travel and tourism a catalyst for positive change. The launch of the Measuring Sustainable Tourism last June in the Philippines, the adoption by Members States during the Chengdu General Assembly of the ‘Tourism and Sustainable Development Goals’ Declaration, the Montego Bay Declaration and the Lusaka Declaration, our 14 official events held in all regions of the world, our first consumer campaign – ‘Travel.Enjoy.Respect’ and our online space for sharing stories, knowledge and actions which gathered over 1000 initiatives, were just some of the initiatives of this Year. All my thanks go to each and every one of the 65 partners who joined us in making this possible as well as the 12 Special Ambassadors for the International Year . This International Year will not end in December 2017. All the work we have done together during this year needs to be sustained and expanded if we are to ensure tourism’s effective contribution to the 17 SDGs. We were, therefore, very pleased to have been able to launch the findings of the ‘Tourism and SDGs’ report at the Closing Ceremony of the Year in Geneva on 19 December. The Report, which was developed in collaboration with the United Nations Development Programme (UNDP), looks into the links between tourism and the SDGs in national policies, in private sector strategies and sets recommendations for our common journey towards 2030. 2017 was also a momentous year for me personally, as it was the last year of my mandate as UNWTO Secretary-General. 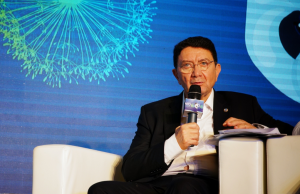 Over 12 years at UNWTO I have seen tourism become one of the world’s most important and impactful socio-economic transformative forces of our times. I have seen its growing relevance to the lives of millions of people around the world, to the preservation of our common values and to the greater understanding among people of all walks of life. I have been touched by every person I have met throughout my humbling, rewarding yet challenging journey and deeply moved by many of the tourism stories I have come across around the world. I want to thank all those who make our work meaningful every day. I also wish to thank all our Member States, Affiliate Members, sister UN Organizations, industry leaders and their teams, associations and global bodies for their support to me and to the mandate of UNWTO throughout these years. It has been a truly humbling experience. I wish to say a very special thanks to the UNWTO staff that made possible every success that the Organization has enjoyed over the past years. I am extremely grateful to everyone I have worked with. It has been a privilege to serve as Secretary-General, not the least because of the diverse breadth of exceptional colleagues I have had the pleasure of working with. I wish Mr. Zurab Pololikashvili, the incoming Secretary-General, every success in continuing to drive our sector forward to a better future. Whatever our business in life may be, let us always remember that our core business is, and will always be, to make this world a better place.